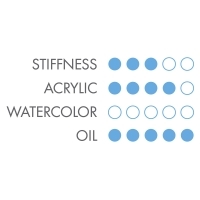 These quality synthetic sable brushes are ideal for amateurs and professionals, for use with oils and acrylics. They feature excellent color holding capacity, durability, point and spring. Get the performance of sable without the high cost. Distinctive gold ferrules are fitted into marbleized red hardwood handles.